It's a rare thing these days to come across a genuine old-school CRPG, one with strict turn-based combat, first-person dungeon crawling and that general lack of hand-holding all pushed to the forefront. 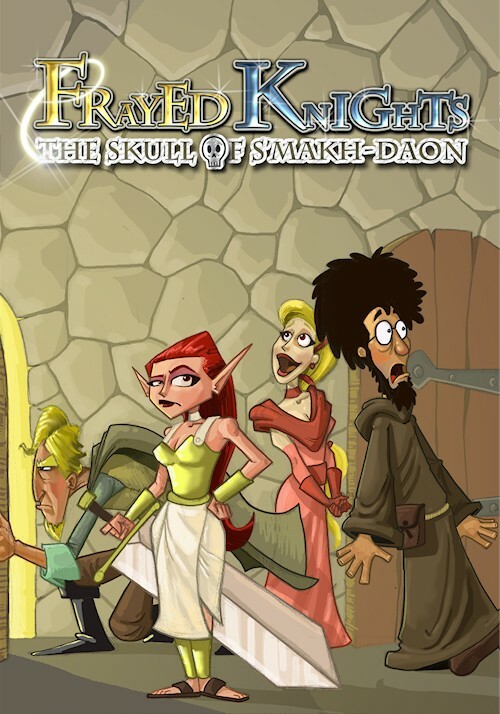 Frayed Knights: The Skull of S'makh-Daon, an independently developed and published CRPG made by a long-time blogger and RPG community member Jay Barnson, who you might also know by the handle "Coyote", intends to recapture all of these more traditional CRPG design traits that have been lost over the last 15 years. Frayed Knights ends up being very successful in this respect, and manages to provide a very solid old-school experience, with some excellent and deep turn-based combat and character development. However, the game's visual style and humor mean it may not be for everyone, and there are some issues with its gameplay, as well as some rough edges with regards to presentation, that keep the game just shy of excellence. The story of Frayed Knights begins with the eponymous Frayed Knights, a band of adventurers made up of Arianna, Dirk, Chloe and Benjamin (warrior, rogue, sorceress and priest archetypes), plundering the Temple of Pokmor Xang, in pursuit of some once-sacred gemstones. The group hopes to prove their worth to the Adventurers' Guild, but unfortunately for them, a rival band manages to get there first and turn in the quest in their stead (no explanation for why the place is still crawling with Pus Golems and Evil Priests, though). Their hopes at becoming Genuine Certified Adventurers(TM) left in ruins, for now, the Frayed Knights soon turn their attention to hunting down the Skull of S'makh-Daon, a deadly artifact capable of immense destruction, and find themselves embroiled in a quest to uncover a potentially world-threatening plot. Frayed Knights started out as one huge game, but has now been split into a series of episodes, so while the game does a good job of bringing its own story to a conclusion, and doesn't really end on a cliffhanger, the overarching story is something that will have to wait for the inevitable sequel(s) to be resolved. As you can probably tell based on the above paragraph, Frayed Knights is not a particularly serious RPG, and that comes through in everything from the cartoony, Monkey Island-esque art style used for the character portraits, to the sometimes absurd enemies and spells (Exploding Kneecaps is one of my favorites), to the dialogue, which reads more like a Let's Play than it does traditional videogame narrative. This is going to be one of the deciding points in whether you enjoy Frayed Knights. While I personally enjoyed the game's sense of humor, I can fully understand if other players do not take so kindly to it. It's hit or miss for different people, certainly, but thankfully, it is quite consistent and the jokes rarely get tiring or annoying. Barnson's writing may not be the best or wittiest in the world, but he imparts a strong sense of character to the game, and that's more than what can be said of many RPGs. Frayed Knights is, at its heart, a dungeon crawler. Although there is dialogue to be read, a town and wilderness to explore, and side-quests to undertake, the vast majority of the game is spent in combat and underneath the ground. The Village of Ardin, aside from serving as a hub for quests, mostly exists as little more than a place to offload your loot and get a good night's sleep. The actual dungeons you'll explore are generally quite varied, and many of them have some sort of gimmick to them. The Minotaur's Lair, for instance, is a large maze of near-identical hallways, with multiple floors, and the minimap is made useless, as the party can't keep track of their position in the maze; meanwhile, the aptly-titled "Goblinville" houses a fair-sized town inhabited by a mix of friendly and unfriendly goblins. Most of these dungeons tie into the game's main and/or secondary quests, and they all have good foreshadowing and storytelling within them, either in the environment itself, or through the characters encountered inside. There isn't quite as much variety in gameplay or layout as some titles, but each of them still manages to feel unique. Despite the focus on dungeon crawling, that doesn't mean that Frayed Knights is devoid of interesting quests, however. Although the game is, for the most part, quite linear, providing the player with a mostly fixed path through the game, many quests have at least one or two minor decisions to make. None of them have any long-term consequences or real moral dilemmas; rather, it's the way in which all of the quests interact that makes them fun to get through. Frayed Knights has a very good way of having one quest lead to another, and then that next quest leading to two more, and most of the game's quests will span nearly the entire length and breadth of it, requiring you to enter multiple dungeons, speak to several different characters, uncover hidden secrets, and so forth; some of its best quests require the completion of others to finish up, and others rely on your own deduction rather than obvious tips. This can sometimes create a feeling of directionlessness, but this can usually be remedied by making a bit more progress or exploring another dungeon. Not all quests end up marked in your journal, either, and when you combine that with the lack of a quest compass, you'll wind up with a great feeling of accomplishment for figuring out where to go, what to do, how to solve a particular puzzle, and so on. Being able to simply deduce how to get through the game for yourself is, sadly enough, something quite rare in RPGs these days, and it's extremely refreshing to see that Frayed Knights doesn't just require this, but does such a great job of encouraging and rewarding it.